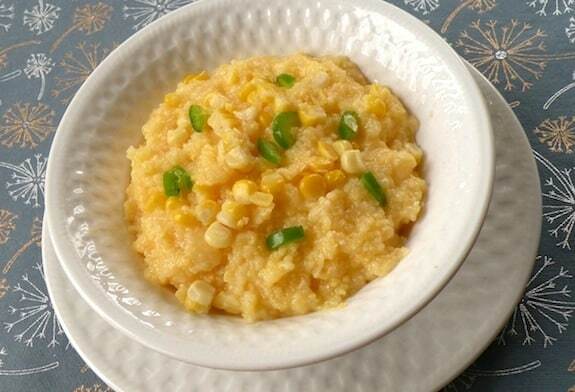 Have you discovered grits (aka hominy grits)? 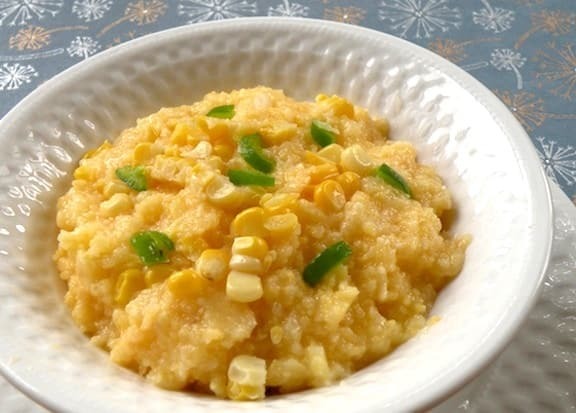 To add variety to your grain repertoire, try grits (hulled, dried, and cracked corn kernels, long a Southern staple). Seek out stone-ground organic grits, which are much more flavorful than the ultra-refined variety sold in supermarkets. I like the Bob’s Red Mill brand; they’re flavorful and are made from non-GMO corn. This is great for breakfast or brunch, but it can also be a change-of pace dinner served with baked sweet potato and a crunchy coleslaw. Adapted from The Vegetarian 5-Ingredient Gourmet. Bring 4 cups water to a rapid simmer in a large saucepan. Lower the heat, then slowly pour in the grits, whisking constantly to avoid lumping. Cook over very low heat until smooth and thick, about 20 minutes. Stir in the remaining ingredients. Heat until the cheese is smoothly melted into the grits and serve. Variation: Add 1 cup cooked fresh or frozen thawed corn kernels.